A giant gas planet was discovered around a dwarf star 600 light-years from Earth. It is very close to its star and revolves in two and a half days. The radius of this planet is 25% larger than its star which contradicts the current pattern of planet formation. 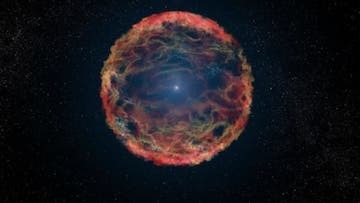 Supernova exploded several times without ever stopping to shine…. A supernova would have exploded several times without ever stopping to shine. The star is at least 50 times more massive than the Sun and could belong to a completely new phenomenon. Proxima Centauri, the star closest to the Sun, is surrounded by two rings of cosmic dust, suggesting a complex planetary system. The first ring is far beyond the only known planet today, Proxima b. An artificial intelligence algorithm has discovered a new planet, Kepler-90i, around the star Kepler-90, making it the first star to host eight planets beside the sun. Research should be extended to 150 000 other stars.